Fermenting peppers is not a difficult process! It is quite easy, but patience is required! Fermenting peppers is an essential step in making hot sauce. Can you make hot sauce with fresh peppers? Yes, technically, you can! Is the hot sauce sooo much better when you fement the peppers? Absolutely, it is! Check out my post for Fermented Hot Sauce. How Can You Use Fermented Peppers? The best use for Fermented Peppers is making your own hot sauce at home! You won’t have to buy the stuff at the grocery store! Many of our favorite hot sauces, in the United States are still made with fermented peppers, including Sriracha and Tabasco. Fermenting the peppers gives the hot sauce a greater dimension of flavors! Fermenting peppers without a salt brine allows the peppers to ferment in their own juices. This intensifies the flavor of your finished product! This method has been employed, by humans for thousands of years! Lacto fermentation was used to preserve vegetables that would otherwise spoil. These vegetables sustained families through barren months out the year. Fermentation was traditionally done in large crocks, so that larger quantities of fresh produce could be preserved. I include the above photo, so that you know, if the top has mold growing on on it, throw out that batch. It is not safe to eat! This one was contaminated because I over filled it with peppers and when I went to burp it the first week, they started to overflow, so, I had to scoop some of them out. I did not sterilize the spoon first. Learn from my mistakes! Wash peppers. Remove stems. Place in food processor. Add salt. About 3 tablespoons per quart of peppers. Mix very well. Pack peppers and salt into quart jars. Pushing down to remove air pockets. Let peppers ferment at least one month. I left mine for 4 months. Technically, the peppers can ferment for years, in large vats, as Tabasco does. That is how easy it is to ferment your own peppers so that you can make your own hot sauce! 3 Tbsp salt, per quart of peppers. Mix 3 tablespoons salt per quart of peppers. Mix well. The salt will draw water out of the peppers and they will ferment in their own juices. Alternately, you can mix 1 quart of unchlorinated water with 3 tablespoons of sea salt, per quart. Sterilize jars. Pack in jars with peppers, pushing down contents to remove air. Leave 2 inches headspace. If using the brine method, cover peppers in jars with the water and salt mixture to cover. It is important the the peppers stay below the surface of the brine. Ferment in cool place for 1 to 4 months, up to years. For the first 2-3 weeks, burp jars daily, thereafter burp once per week. Use fermented peppers for making hot sauce. 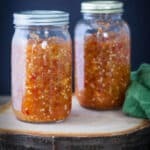 Such an interesting post Beth, I never thought of fermenting peppers and had no idea about it, I just used to mak small batches of hot sauce for immediate consumption. On my way to the market to buy me some peppers, will try your recipe as soon as I get back home, YUM! The hot sauce is so much tastier with fermented peppers! Thanks so much for your comment Patty! Let me know how you make out! This is fascinating! I’ve never tried fermenting anything but hubby and I love hot sauces so I’m thinking I need to start with peppers! It’s really easy and hot sauce is awesome! Thanks Marie! Good Stuff! Thanks for stopping by today Michal! I’ve fermented a lot of foods but I’ve never done peppers before. Will have to give this a go! I really love the hot sauce that these produced! Thank you Lisa! I think you will love it! Thanks for stopping by and checking it out Noelle! I love that you included your batch gone wrong and pinpointed exactly how and where the mold came from. As someone who is still getting into fermenting, I really appreciate the lesson! That is all part of the learning process. Isn’t it? Thanks for checking it out Rae! Never realized how simple it is to ferment foods. Love all the tips you included too! Thanks so much Amanda! I really appreciate that! Have a nice weekend! This is such a popular method in Hungary and is used all of the time, the best restaurants all serve fermented vegetables and I love them! I think it is just gaining a bit of popularity here in the US, of course decades ago, it was a very common practice! Thank you Brian! I so need to try this. I wish I had a garden, though I can just go to the store! This looks so delicious. I’m going to have to make this when I can get good peppers!! Great instructions Beth, I feel I could make it! Thank you Elaine! You could certainly buy organic peppers in the summer and make it! Then you could make your own hot sauce! These look great, and both a great way to preserve some peppers as well as use as a base for sauce, as you suggest. Thank you Caroline! I appreciate your comment! I have never thought to ferment my peppers but what a great way to make a hot sauce! I’ll be planting Italian red chili peppers in my garden soon. I usually just dry them but def want to try fermenting some of them! Oh, I bet they will make an amazing hot sauce! Enjoy! And Thank you Jacqueline! I’ve pinned this and can’t wait until summer pepper growing season. I plan to ferment peppers using this recipe and then making your amazing looking hot pepper sauce! Thanks for sharing! Thanks so much for the comment, Susan! I appreciate it! Shoot a few pics and share them with me, please?